Step 2: Enter your identification information. Click “Enroll”. Step 4: Create a username and password. Click “Continue”. Step 5: Set Up your Challenge Questions. Click “Continue”. Step 7: Mobile Banking Enrollment. Click “Enroll” to access your account using your mobile phone. Step 1. On the Log in page, click “Forgot Password”. Step 2: Input the information and click “Reset Password”. The email address that you enter must match the email address we have on file for you. 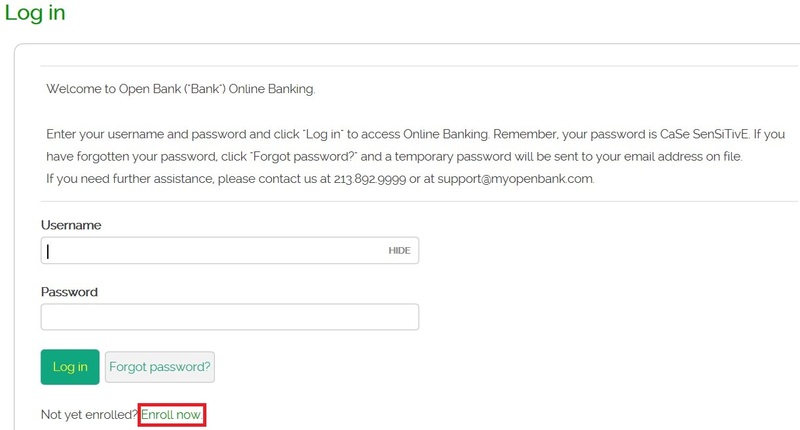 Step 3: Login using the temporary password that was sent to your email address. What can I do with Open Online? You can view your account history, view check images, view/print statements, download transaction history, place stop payments, categorize your transactions, transfer funds between your Open Bank accounts, set up alerts, order checks and pay bills. How do I enroll in Open Online? To enroll in Open Online, you need to complete a one-time enrollment process. You can enroll by clicking Enroll Now. Can I enroll in Open Online without an email address? 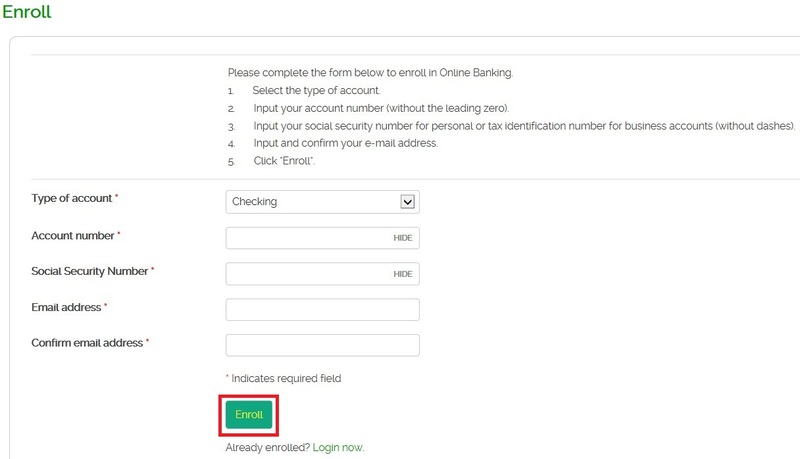 No, an email address is required to enroll in Online Banking. Can I enroll in Open Online without a Social Security Number (SSN)? How come I do not see my account information after I enroll in Open Online? Your account has been newly opened. You enrolled with the incorrect information. For example, if you only have a business account with Open Bank but you enrolled using your SSN instead of the Tax-ID #. Does my Open Online access expire? Yes, if you do not log in for more than one year, your online banking access will be terminated. If my Open Online access expires, can I use Open Online in the future? Yes, you will need to re-enroll using Enroll Now. You can change your password anytime within the “Profile” section in Open Online. 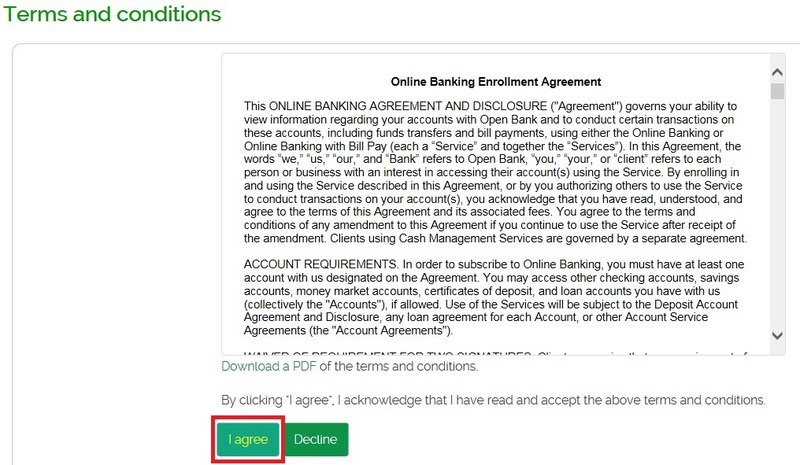 The “Profile” link is located at the top of every online banking page. You can click “Forgot Password” and you will receive a temporary password or you can contact us at 213.892.9999 or visit one of our branch office locations. I do not remember my username. How can I retrieve it? Contact us at 213.892.9999 or visit one of our branch office locations for assistance. 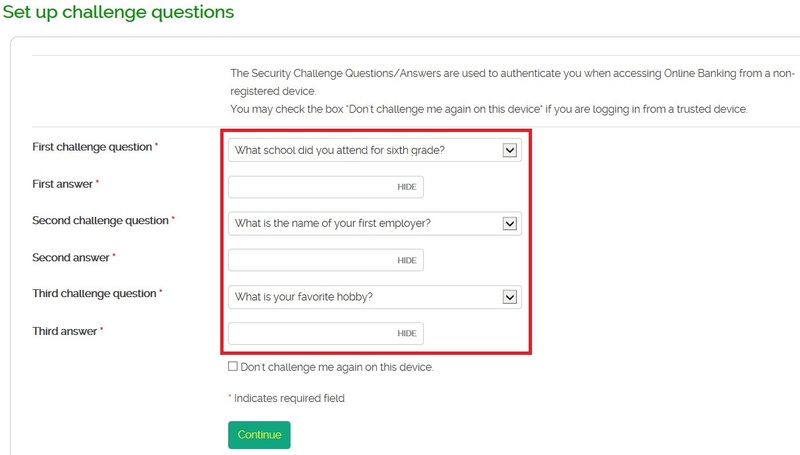 I do not remember my security challenge answers. How can I retrieve it? Does Open Online have Bill Pay services? Yes, Bill Pay services is available for consumer accounts. I have a business account, can I use Bill Pay in Open Online? No, for business accounts, you will have to use Cash Management (Business) Online Banking. Contact us at 213.892.9999 for more information or visit one of our branch office locations. What is eStatement? Is the service free? 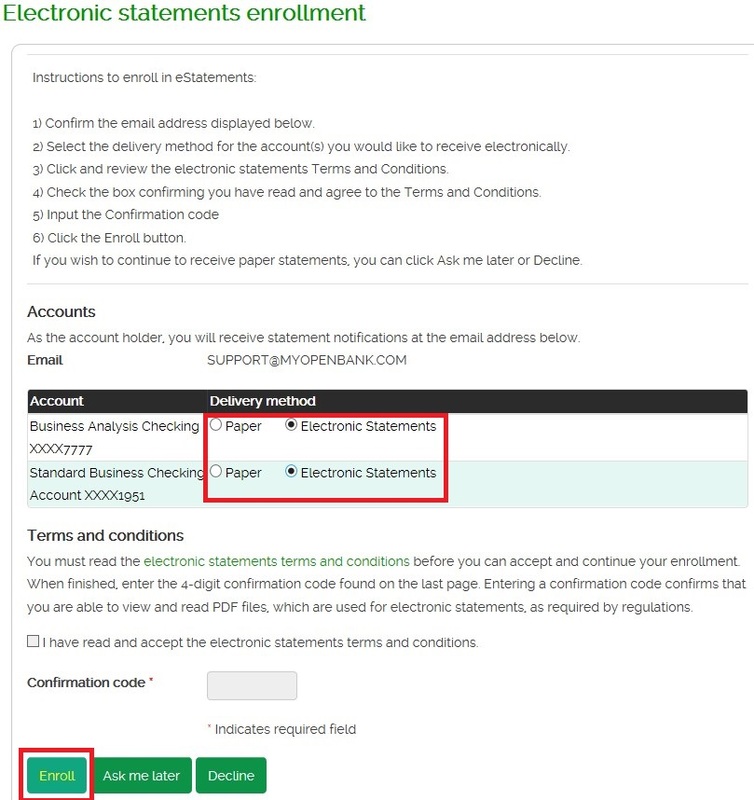 eStatement is an electronic version of your paper statement. There is no charge for eStatements. Popmoney is a person-to-person payments service that enables you to send and receive payments electronically via text or email requests. U-Choose Rewards is a rewards program that allows you to earn points by registering your Open Bank debit card. Can I log in to Open Online through the Mobile Application? Yes, you can. However, you cannot access your Cash Management (Business Online) profile using the Mobile Application. Can I use Bill Pay through the Mobile Application? Yes, however, not all Bill Pay functions are enabled through the Mobile Application. Can I deposit checks from my smart phone? Yes, mobile capture is available through our mobile application. Can I transfer funds between my Open Bank accounts? Yes, you can transfer funds between your accounts as long as they are the same entity. Can I transfer money to other financial institutions? No, you cannot transfer funds to other financial institutions. Can I order checks through Open Online? Yes, you can order checks by clicking “Order Checks” on the account level. Technical Helps allows us to remotely access your computer to provide better support. I am experiencing some issues, who can I contact for assistance? You can contact us at 213.892.9999 or by email at support@myopenbank.com. Does Open Bank have a Demo site? Yes, you can view a demo which explains Open Online in further detail. Which web browsers are compatible with Open Online? Transport Layer Security (TLS) is a cryptographic protocol designed to provide communications security over a computer network. Open Online requires TLS 1.2. Which operating systems support TLS 1.2? How can I check or enable *TLS 1.2 on my web browsers? For additional questions or assistance with enabling TLS 1.2, please contact us at 213.892.9999 or by email at support@myopenbank.com.